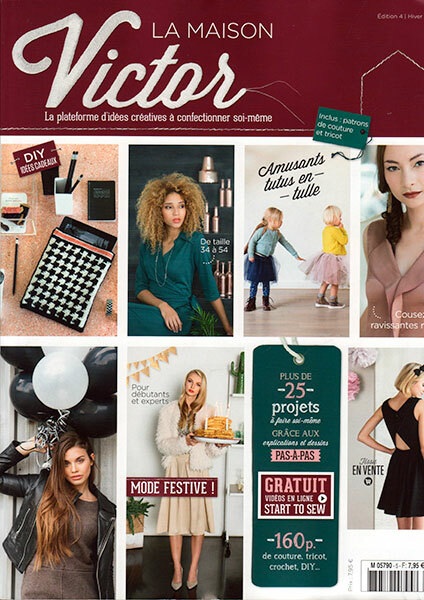 While we were relaxing in the Loire Valley in France a few weeks ago, I took the opportunity to hit up some of the big hypermarchés’ magazine sections and flip through all the sewing magazines! I saw the usual suspects like Burda, Elena Couture, and Fait Main but also a fair amount of new(ish) ones, too. I was unimpressed by the several magazines which simply reprint Big Four patterns (I understand the economics, but I’m not tempted in the slightest), but excited to see Fashion Style (the French language version of KnipMode, which I’ll share in a future post), and also Couture Actuelle, the French language version of Patrones, and of course, La Maison Victor! 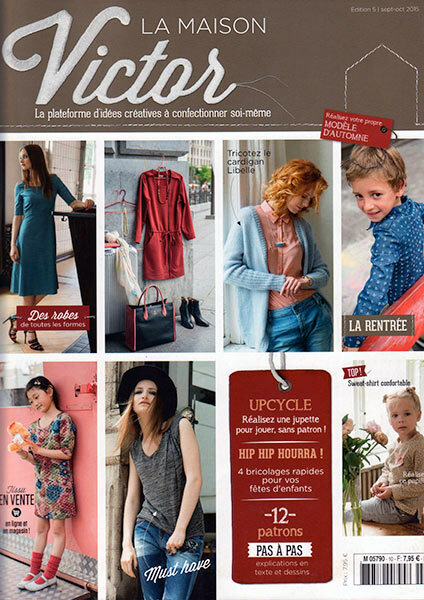 La Maison Victor – their first English-language magazine!! If you’ve followed this site for any length of time then you’re probably already aware of La Maison Victor magazine, as I’ve been buying up issues whenever we’ve travelled to France over the past few years. It’s a Belgian pattern magazine, which started off as quarterly in the early days, expending to 6 issues a year and publishing in French, Dutch, German, and now… English, too! 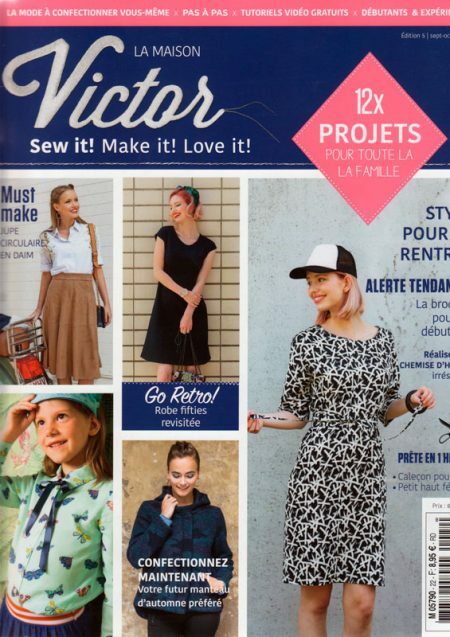 This is super exciting because I love La Maison Victor‘s aesthetic – definitely more like a fashion magazine than a sewing magazine, and unlike some *cough* Burda *cough*, each of the patterns has incredibly well illustrated instructions, so they’re suitable for beginners, too. 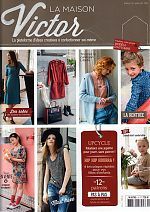 The Belgian pattern magazine La Maison Victor is usually something I hunt down while we’re in France (the Eurotunnel Calais newsagent being an reliable stockist!). But LMV expanded last year into translating in German (on top of Dutch/Flemish and French), meaning it’s available in Germany now, too. 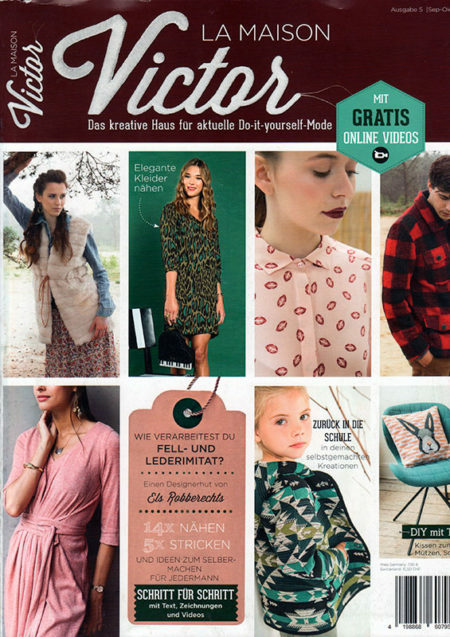 It wasn’t quite as easy to find as the many flavours of Burda, or even Ottobre, but the major train stations in Berlin seemed to stock it, and it was the only pattern magazine I purchased during our trip. 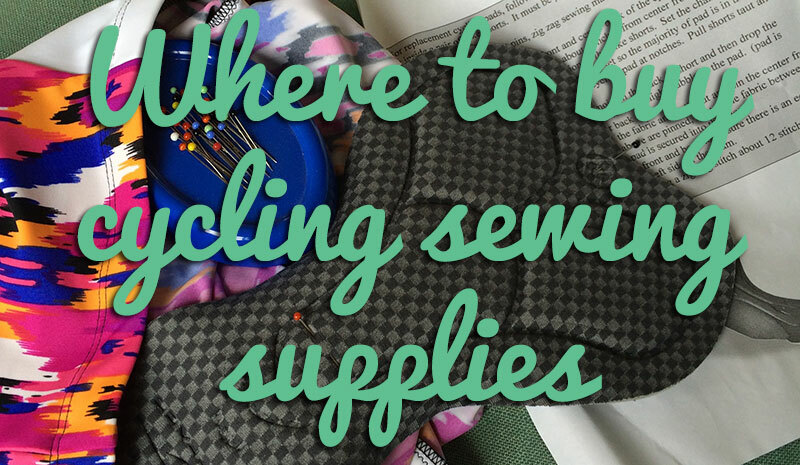 Boxing up all of my pattern magazines when I moved into my new sewing room showed me how many I have already, so I’m a bit more judicious in buying them these days – there’s got to be at least one “Must Make!” in an issue for me to buy it. 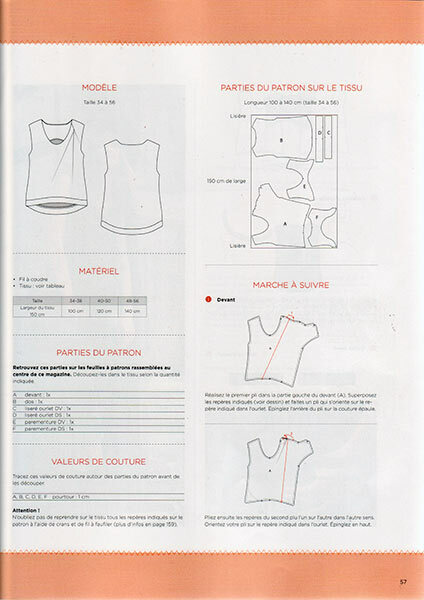 Luckily, I know La Maison Victor always has a good range of patterns, excellent illustrated instructions (you really don’t need to speak the language, honest! ), and beautiful presentation, and I wasn’t disappointed. My bestie Pip recently travelled to Belgium for a pre-Christmas trip round the markets and spotted this for me on her way back through Eurotunnel Calais (the WH Smiths on the Calais side regularly stocks La Maison Victor, which is handy if you’ve got friends or family who regularly travel through there). This is their holiday issue but there are a surprising amount of casual patterns included, too. 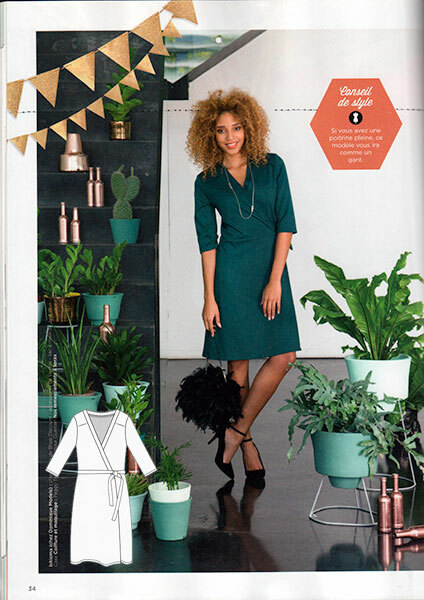 First up, this is my absolute favourite pattern in this issue – check out the back on this dress!! It’s actually a really simple effect to sew, too, with two deep pleats in back and a simple hook and eye at the neckline. The front is very plain (wisely leaving the interest to the back) and the dress has an overall shape which is very trendy right now. Plus it’s offered up to size 56, and the silhouette would lend itself to disguising a few extra holiday mince pies, too. 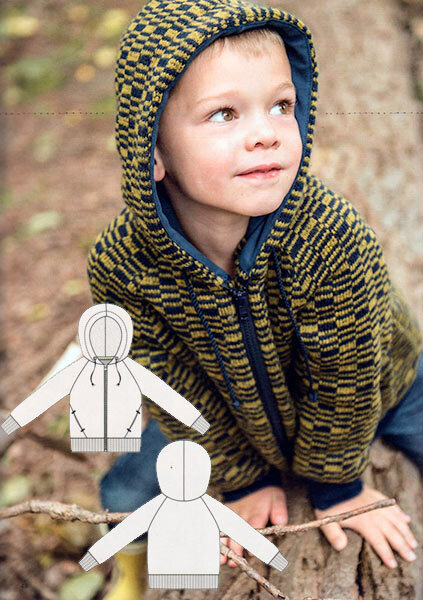 LMV always include as many boys patterns as they do for girls, though this sweet little hoodie could easily work for either gender, depending on your fabric choice. (The men’s pattern this month is just a boring waistcoat). I’ve got a big stack of magazines from Argentina to scan and show you, but I wanted to get this one up first while it’s still current in case any one wants to order it for themselves (yeah, it’s quite good!). 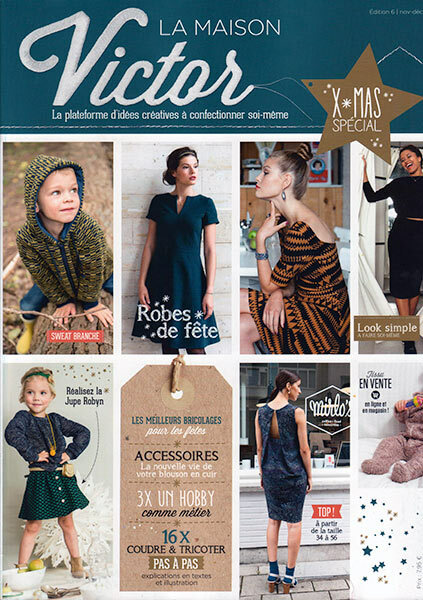 If you recall from last year when I bought my first issue, La Maison Victor is a Belgian sewing and knitting pattern magazine that publishes bi-monthly (up from quarterly!) in French, Dutch and German and features fully illustrated instructions for each step, too. 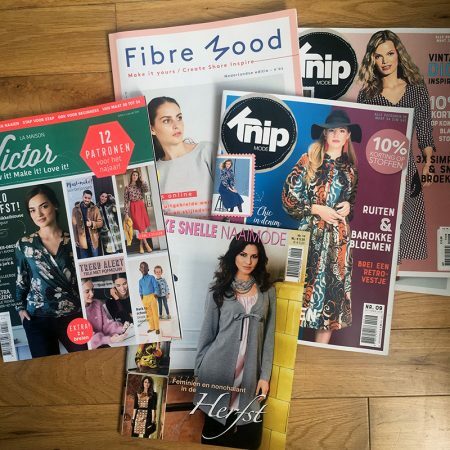 I was really impressed with my first issue so I was keen to try and buy another while we were in France for a wedding a few weeks ago – I was pleased to see that it was fairly easy to find. If you’ve got friends or relatives travelling back to the UK through Eurotunnel (where you drive onto the train which takes you under the English Channel), the WH Smith at the Eurotunel Calais Terminal has stocked it every time I’ve looked, and so is a good bet for directing others to buy for you. 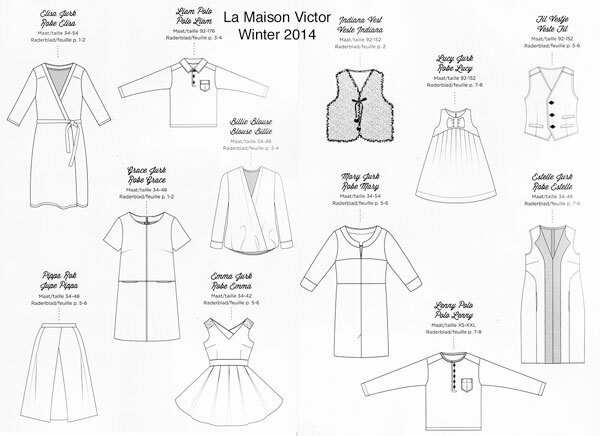 La Maison Victor offer patterns for children as well as adults, and they seem to have a good balance of patterns for both boys and girls. 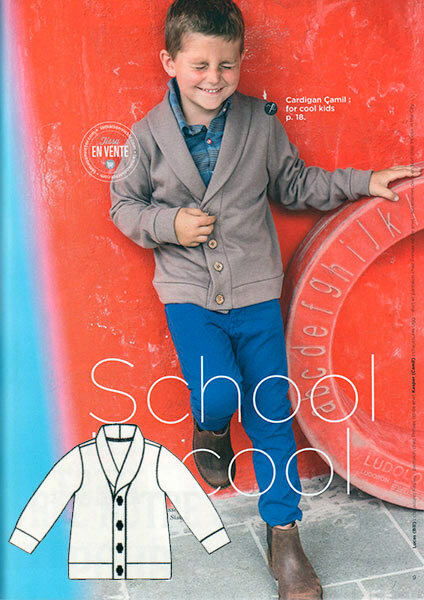 Here we see a boys cardigan with buttons and a nice shawl collar, made from sweatshirting instead of the usual sweater knit. This issue also includes a button-down long sleeved shirt for boys as well as a girl’s sweatshirt that could easily work for either gender. 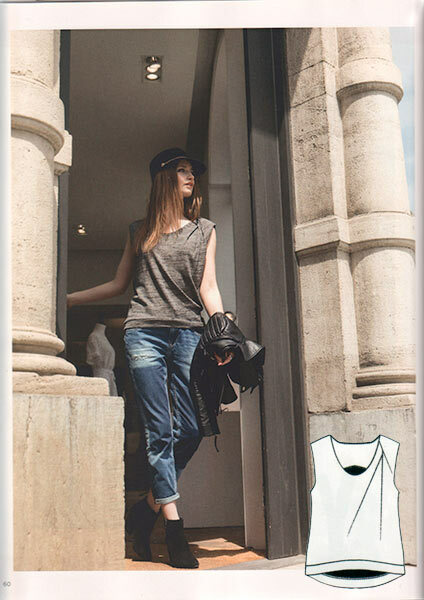 How much do I freaking love this Top “Dusty” with its asymmetric shoulder pleating! This design is SO me that I’ve already traced and cut out fabric for it… but because I don’t fancy the sleeveless bit or the facings, I’ve just traced out the Front and frankenpatterned my basic teeshirt block to it so I can give it long sleeves and a neckband. Also because someone on instagram made it and said the neckline and armholes are really low, and by making it match my teeshirt block, I’m avoiding any potentials there while still keeping the shoulder pleating. 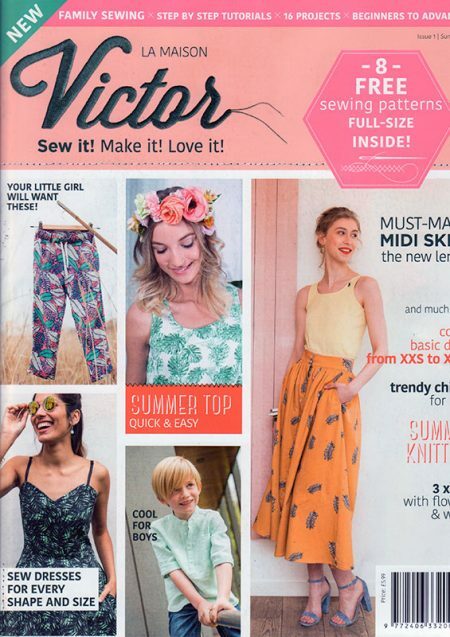 The dresses for this issue are fairly boring, if you ask me, but then again, I’m bored by 90% of the dress patterns I see available anyway, so maybe I’m not the best judge of what women actually want to sew… Classic, or boring? It’s a fine line I suppose. It’s no secret that I’m a big fan of pattern magazines, and I’d heard whispers recently that there’s a new Belgian pattern magazine on the market, so I kept my eyes peeled while we were in Brussels for the weekend in December… and couldn’t find it. But then, just as we were apart to take the Eurotunnel back to the UK, I found a copy of La Maison Victor in the WH Smiths in the Calais terminal! Hurrah! 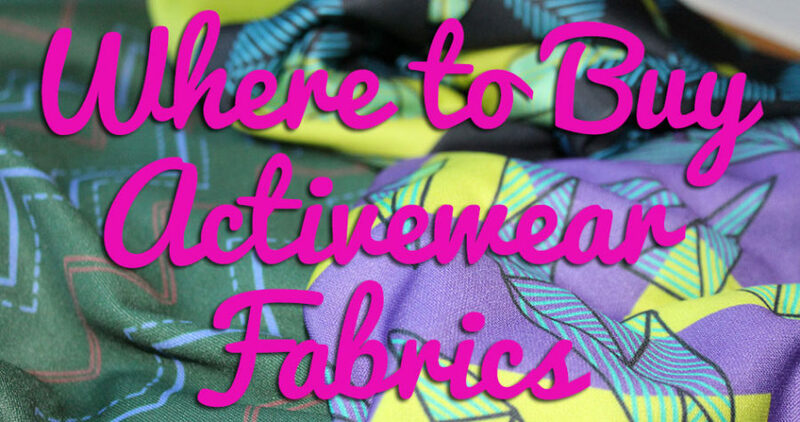 So I can share details of the newest pattern magazine to you, and it’s good. Like, really, really good! 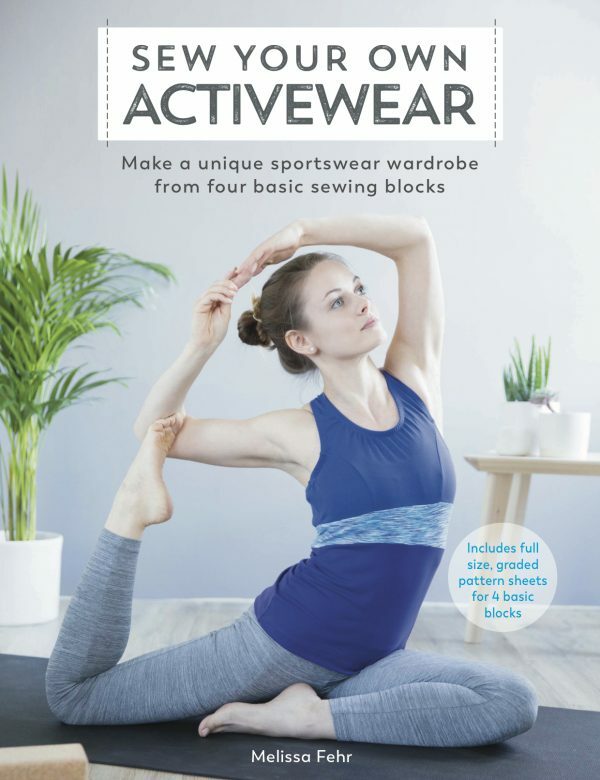 It’s a quarterly magazine printed in Dutch, French, and German, and contains patterns for both sewing and knitting for both sexes through from babies to adults! 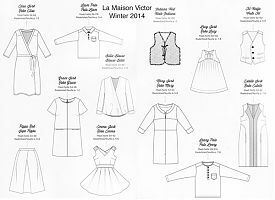 First up, I know you want to see the patterns that are included in this issue, and La Maison Victor make it easy – the pattern sheets are included in a special booklet in the centre of the magazine with the tech drawings printed on either side. You can tell they really did their research on this, as a lot of sewists prefer to keep their pattern sheets separate from the fashion magazines. This magazine has got fantastic art direction and styling. It really feels like a boutique fashion magazine, and the garments are shown in a variety of poses and detail shots, and some, like this, are just to lay out what’s coming up in a feature. 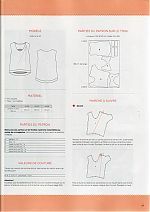 One of the included patterns is for a basic wrap dress, but again, styled and presented very nicely, and with the tech drawing, layout, and instructions appearing immediately after it in the magazine. 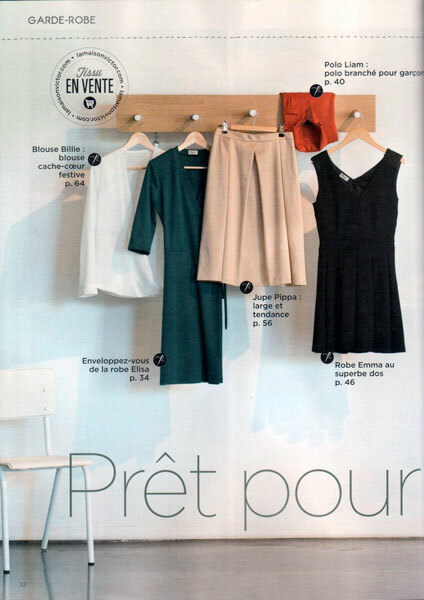 This is great as it means you don’t have to keep flipping to the instruction section while holding your place in the regular magazine (like I do with Burda, Manequim, KnipMode, La Mia Boutique, Patrones, etc etc).